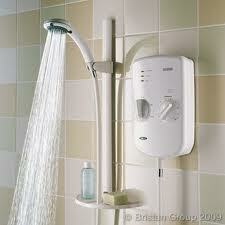 We can fit a new Electric Shower, which is a must have item these days in anybody's home. If you don't have room for a full shower or even a corner shower cubicle, then a standard, over the bath, electric shower is more than adequate for most people's needs. You can have a shower and be dried off in less time than it takes to run a bath and a shower is much more hygienic than lying in a bath anyway.